‘What – no Disney?’ I asked in abject horror. I think if Hubby had suggested cutting off my left arm I would have been more amenable. A last minute opportunity for a week off in November – there was always only one place I wanted to go. But having ‘done Disney’ the previous year Hubby wanted something a little different. There was little time to plan anything too complex – we had to go somewhere we knew. And Florida was the obvious choice for us. Ignore Election negotiations, proper, intense, serious diplomacy followed (actually what really happened was I put on a spectacular paddy threatening to go into work instead). Finally, after two hours of the fiercest of deliberations, we emerged with something approaching agreement. Florida it was – including one day at the Magic Kingdom. Fly into Orlando, get my Disney fix, up to Kennedy Space Centre, one day Busch Gardens, a day shopping, then the Everglades, before down to Miami beach for the final day. Quite a bit of travelling, but a chance to sample some of the alternatives to the ‘Big Hitters’ of the theme parks. I absolutely adore the variety of restaurants, the choice of food and the buzzing, friendly and impeccable service. But my ultimate favourite is always the Cheesecake Factory. A menu the size of your average reading book, with over 250 dishes, including about 35 variations on their signature dish – the cheesecake of course. It had become my firm favourite ever since visiting on a business trip a few years earlier. 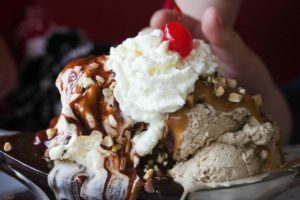 Since then Hubby had never heard the end of ‘how we MUST visit this place.’ But going to Disney, we had previously spent every waking moment in theme parks and tended to grab something there. Also, Hubby just loved a cheesecake. He therefore took little persuading when I suggested it for our first night in Tampa. Choosing something off of the ‘Snack’ menu, the Roadside Sliders (“mini” burgers), Hubby ignored all advice to the contrary about portion sizes at this place and just went ahead and followed this up with “Adam’s Peanut Butter Cup Fudge Ripple” (Adam clearly had a creative imagination – what a concoction!). Thinking he knew best – well we had been to America before and he had seen plates of food, so what was the problem? As his six burgers arrived – they may have been mini in America but looked remarkably like a standard size for the UK – Hubby leaning back on his chair took a sharp intake of breath at the challenge before him. I just smiled – knowingly. Undeterred, he chomped through the first course, before the best bit – the cheesecake – arrived. I could see in Hubby’s eyes the size of the helping was a little more than expected, shall we say. “Why don’t you just box it and eat it tomorrow?” his sensible wife suggested. But no, refusing to be beaten, as if now on some crazed mission, Hubby set about eating this dessert – all of it. And it took a while….. Emerging from the restaurant, I could tell he was struggling. But I was saying nothing. We were off to Busch Gardens in the morning. Hubby had been unable to even face a cup of tea at breakfast. Only water and Rennie. First stop, SheiKra. Two hundred feet high with a 90-degree drop as its starter for ten. Fab! Well unless you had vastly overeaten the previous evening. I could see that from this perspective it was looking pretty terrifying. But Hubby knew better than to expect sympathy, instead soldering on in silence. Kill or cure I guess. From SheiKra it was off to Montu and Kumba. Hubby was hanging in there – and I don’t mean his feet dangling from the rollercoaster seat – still white as a sheet but as yet maintaining composure. He knew I was purposely doing all the largest rides first. “Could I just have a moment before we go on,” he piped up now also somewhat shaky on his feet. Relenting just an inch, we took ten minutes. Before we were back again, queuing for the next Monster. But survive the day he did, and by early afternoon, with the last effects of the cheesecake clearly dissipating, he too began screaming in delight at the various twists and turns of the mammoth steel coasters. Emerging at the end of the day, smiling at each other arm in arm, we had reached a truce. He was obviously made of sturdy stuff…. As for the overall trip itself, we did indeed have a brilliant time. An awe-inspiring visit to Kennedy Space Centre probably my second favourite day (the best was of course Disney…!). Whatever your opinion of Space Travel in ‘times of austerity’, I find the sheer abilities of the people in the space project totally mesmerising. The millions of faultless processes, the seemingly tiniest of issues that become major problems in such an environment and the courage with which the astronauts take to the sky in a rocket full of lighted fuel. And the ultimate – what it must be like to just sit in that capsule and look down upon the earth. Certainly if I won the £100m lottery, top of my list would be Virgin Galactica! Anyway, back down to earth…. From Tampa, driving to a divine seafood restaurant in Clearwater – the Lobster Pot – and the Courtney Campbell Causeway. For Hubby, this was the ultimate white knuckle ride. No not because of speed or loop the loops. He could see me straining to see over the wall, whilst driving, to catch a glimpse of the amazing sight over the water. His white knuckles came from holding on so tight, hoping I could still drive in a straight line and not into the water I was so keen on glancing at. Florida Keys is certainly on the bucket list after that! Then the Everglades. Often overlooked, but less than an hour from Miami, the exhilaration of the airboats, the trepidation of seeing the alligators and the sublime, rugged landscape. Definitely an escape from the commercialism and hubbub of the theme parks. But as ever when on holiday for just a week, time may go slowly whilst at work, but it always seems to whizz by when on holiday. And this was no exception. OK so I had to get my One Day Fix of Disney. 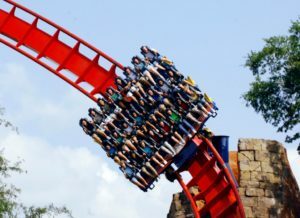 And OK, I also chose Busch Gardens for my Rollercoaster Adrenalin Fix. But other than that, it did show that it really is possible to go to Florida, enjoy the food, the sunshine, the shopping and many other sights, without getting too involved in the bedlam that often is Orlando. The weather in Florida makes a trip here possible all year around. However, there is a risk of hurricanes between June and November, although these will tend to pass through and ‘normality’ is quickly restored. Direct flights to Miami, Tampa and Orlando are available from London Heathrow and Gatwick with many major scheduled airlines, among them US Airways, American, Virgin and British Airways. Flight time is approximately 9 hours. Flights prices start at around £500 per person. 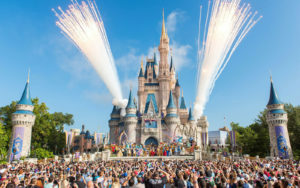 Whilst for many, like me, Walt Disney World is the centre of Orlando, Florida, America and the Universe, it actually takes up just a small area of the massive US state that is Florida. Larger than England and Wales combined and split into five distinct tourism areas – Florida comprises the north-east, central, south-east, Gulf Coast and the Keys. It is a state with great beaches with more than 1,200-miles of coastline along the Gulf Coast, but also surfing and watersports, in particular on the Atlantic side. 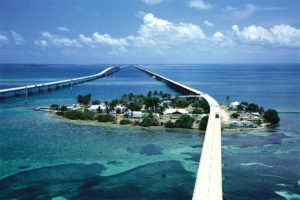 Many also take a trip down to the Keys, the jewel-like string of islands that arc 120 miles off the southern tip of Florida down into the Caribbean before finishing just 90 miles from Cuba in Key West. The North-East principal city of Jacksonville is a lively and modern city with a beautiful riverfront, nightlife, shopping, and beaches and for the golfers, the world-renowned golf resort of the Tournament Players Club at Sawgrass.